my Ink well: Happy Birthday Peg! Wishing you the happiest birthday Peg, and a year of blessings. My dear Friend Peg's birthday is tomorrow. While looking around for some inspiration for Peg's card, I came across THIS wonderful card by June Houck of Simply Elegant Paper Crafts. I decided to CASE it. I found June's blog via the Cuttlebug Challenge Blog yesterday. June's work is fantastic! 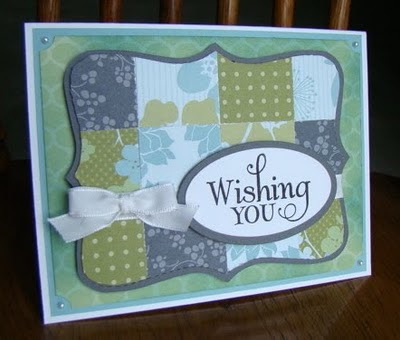 Her Be Inspired #65 Cuttlebug Challenge Card HERE and HERE bowled me over!! I have so many scraps and papers that are retired and unused, so June's Thank You x4 creation inspired me to make this quick card that is perfect for any occasion. I love it and I am sure I will use it time and again. Thanks June! Paper ~ White Paper Basics from Papertrey Ink, Baja Breeze (retired), Green Tea DSP (retired), Basic Gray. Stamps ~ Verve's "Wishing You". Ink ~ Versa Fine Onyx Black. Accessories - Bigz Top Note die, dimensionals, Kaiser Pearls, 1/4 " white taffeta ribbon, Bow Easy, Ticket Corner Punch, 1 1/4" Square Punch.